7q. "I Need Blank Tiles!" BUYERS & LOOKYLOOS: Just scroll down and read the sellers' posts. If you see an item you wish to buy or trade for, please contact the seller by email. SELLERS: Write an announcement describing the accessories that you have to sell or trade (racks, bettors, wind disks, "money" sticks or chips, dice, cases, cards, chochkes, etc.). Please describe your item as completely and accurately as possible. Limit one post per seller (second post will result in deletion of previous post). You can click the image below or you can email your post to "webmaster at sloperama dot com." No information you provide through this website shall be deemed confidential. No shouting. Sellers are advised to be wary of buyers who place large orders, then send a check for considerably more than the purchase amount and want the surplus refund mailed to an alleged friend or relative. The check is no good. Read FAQ 7.n. And click here to see examples of actual scam emails received by the webmaster of this site. And don't fall for these scams. When you make a new post, any old posts of yours are deleted. If you update your posts often, consider banner advertising (contact Webmaster@Sloperama.com). In an effort to keep the Maj Exchange lean and clean, the listings are cleaned up when the page gets too large. If your item has not sold and was delisted, please feel free to relist it. Sellers: EMAIL YOUR ANNOUNCEMENT to Webmaster@Sloperama.com or click the picture below to submit your Accessories For Sale post. In your email, you must describe the items you have for sale. Entries that do not provide sufficient information will not be posted. Do not email photos to us with your announcement. If you have photos or a sale page online, you may also provide the URL (the web address) of the online location of your photos (we do NOT host photos for you - that is not part of the free service we provide). Read www.Sloperama.com/majexchange/pictures.htm for information about how to post pictures online. Then once your photo is online, provide the URL along with your post. No shouting, please. Typing in all capital letters is considered "shouting." If any part of your post is typed in all capital letters, it will be converted to all lower case before going online. Click this picture to submit your own announcement, or email the address above. 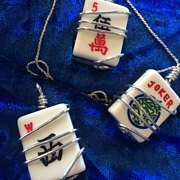 Check out my one-of-kind Mah Jongg Accessories - just opened this etsy shop up last weekend!! For sale: Very rare Mah Jongg book produced by 2wice Arts Foundation for a New York Mah Jongg exhibition, that eventually traveled the country. Beautifully designed and printed on a variety of papers, full of photos and illustrations, and perfect for the collector or enthusiast. My name is Christine Whitman and I'd like to be included in your vendor / resources / items for sale page(s). Christine Whitman Designs specializes in the design and creation of hand crafted, custom Mah Jongg racks. Our current line includes our new Mah Jongg sets on wheels with double wheels at the base rather than the single wheel on each side offered on sets you find online. You will find over 85 items to choose from. Gift items and accessories are readily available from stock at our new facilities in Casselberry, Florida by beautiful Winter Park. We are a company focus on providing high quality automatic mahjong tables, sets, tiles, dices, etc. with competitive price. Our table products are micro computerized to shuffle and wall tiles or cards for all games. If you are interested in our automatic mahjong tables, please feel free to contact us to get further information. We sincerely hope to establish relationships with customers worldwide. Would you please forward the email to Purchasing Department? Company: Xiamen Splendid Cospark Import & Export Co., Ltd. Address: Room 502,Building 5,No. 35,LeHaiBeiLi,Jimei District of Xiamen,Fujian,China. �Mah Jongg� players know that name recognition during Mah Jongg games make for a friendlier game. Our new �Cloisonne Mah Jongg� name badge is more professional and easier to read than a paper sticker. Here is the link to pre order 2014 cards. We recommend our new product--Japanese automatic mahjong table. Items For Sale: Unique and stylish Mah Jongg designs reproduced on quality products by Zazzle.com: Magnets, tiles, bags, mugs, T-shirts, teapots, and more. items for sale: new mah jong 'joker stickers" and personalized mah jong "cheat sheets"
might like some more abstract or fun approaches to stickering your tiles. Do you find yourself trying to remember speciality hands ... ? Do you find yourself struggling to add up your personal score ... ? Ever wanted to try and learn to play Chinese Rules Mah Jong ... ? Need an excellent training aid for new players ... ? www.MahjongMahjong.com has designed a double sided speciality hand "Cheat Sheet" and double sided scoring and doubling sheet. The sheets are laminated to make them durable. For just US$24.99 (including shipping) you get a set of 4 doubled sided "Cheat Sheets" and 4 double sided scoring sheets with doubling table. We will even personalize the sheets with your name or a name of your choice - maybe you would like the name of your Mah Jong group on the cards? Could you please consider putting the item below (edited as you wish) into any appropriate Mah Jongg websites, blogs, group emails, online or offline newsletters or journals? A more detailed media release is attached. For more information please contact me directly or via our band email below. Do you live in the Los Angeles area and own a Japanese automatic mah-jongg table? Steve Sera is a highly skilled and experienced mechanic, has spare parts for many table models, and even better, he makes house calls! Email him and tell him Tom Sloper sent you. Old posts are subject to removal. Our apologies for any inconvenience caused. If your post was removed, please feel free to post again! When a seller posts a new post, any old post by same seller is deleted. To request removal of an outdated or erroneous posting (or a spam), email webmaster. There are several bulletin boards on this site - when requesting removal of your post, please tell us which board your post is on (this is the ACCESSORIES FOR SALE board).